I’ve been meaning to write about my birthday party, which happened a few weeks ago at this point. The theme was “Come as you aren’t,” a brilliant idea that was originally suggested by my friend Mike on this blog. It took me almost a year and a half to implement the idea, but it was completely worth the wait. 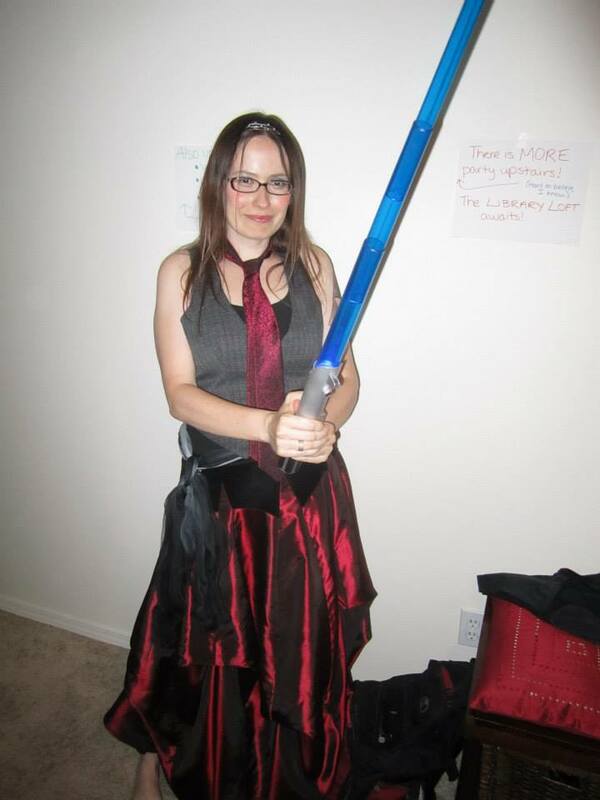 With my shiny lightsaber that makes cool noises! We also had some unusually smartly dressed people, a belly dancer, another Jedi complete with Hawaiian shirt (yes! ), and a whole host of other oddments of apparel. It was a fun spice to add to an evening of celebration. 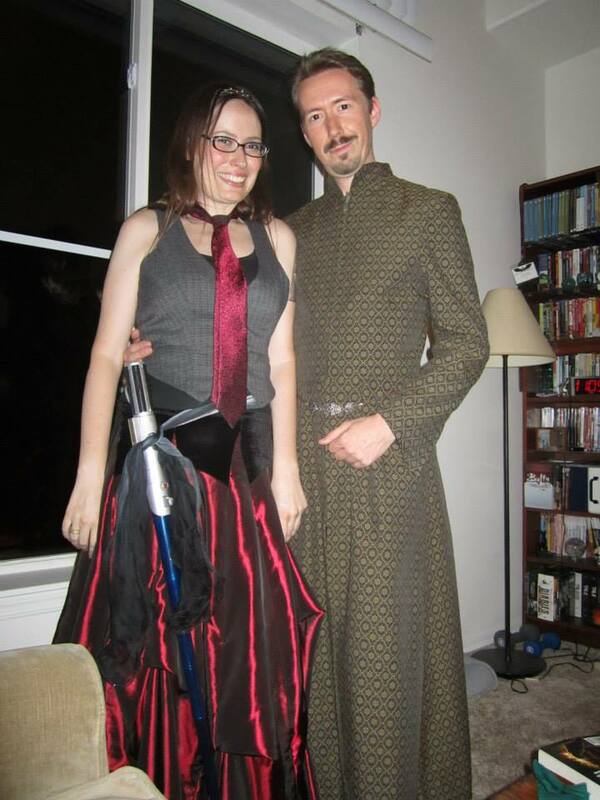 And here’s me with Petyr Baelish for good measure. I have a confession to make: the obligatory singing after the cake candles have been lit usually makes me somewhat uncomfortable. I always do it anyway at my birthday parties because I tend to get attached to traditions, even ones that cause me slight awkwardness. But it’s hard to be the center of attention when I’m not DOING anything. I don’t usually know where to look or what to do with myself. I kind of wish I could sing along. But this year, the moment of singing was the most memorable and the most touching. I didn’t feel awkward. Instead I felt surrounded by the love and support of my friends who had gathered in my overly hot apartment to celebrate the fact that I exist and that we get to know each other. I felt caught up in a strangely physical experience made of singing and proximity and affection, like I was receiving a hug from all my friends, even those who couldn’t make it. I’ve written about creating a chosen family of friends before, and this has been my most tangible experience of this. I used to be so afraid that having such a family was impossible, that the only way of receiving this support was through blood relatives and significant others. I’d comb the internet looking for people talking about chosen families, and I’d come up relatively empty-handed. Why was nobody talking about this? I didn’t know, but I held close the few examples I knew about. I needed the hope. So when I say that I have never felt as loved and as safe as I did at my recent birthday party, I say it both to thank those of you who have touched my life so significantly and to pass that hope along to those of you who need it right now. Creating a chosen family of friends IS possible. Whatever your situation–if you don’t have much or any family in your life right now, if you are single, if you’ve moved to a new place, if you’ve been through a lot–none of this consigns you to a life of being alone and unconnected. And of course it’s not just the birthday party. Regular readers of the blog may have noticed I’ve been having a tough time this last month and a half. But one of the things that has made it much easier than it otherwise would have been is the friends who have been reaching out to me. This time has been an inadvertent pressure test, and it has left me with the strong realization that yes, my life really is different now. I am different, and the relationships I have in my life are different, and these changes are a source of strength and solace. And when it comes down to it, good friends will take you as you are, even when you come as someone different than you used to be. It looks like a great time. I was admiring the birthday pictures over the weekend. Happy Birthday, Amy. I’m sorry you’ve been feeling down, and glad that the party brought you up. Amy – I know we don’t always get to join you on your adventures, but we whole heartedly support you just for you and the joy you bring to the world. I am so happy you and M were able to catch up recently. Happy belated birthday!